The two sisters Kan lived in Meppel: Sariena and Judik. Born to Meijer Abraham Kan and Serliena van Zuiden. Meijer Abraham was born in Meppel (1819) and married Seppien Zaligman from Dwingeloo in 1846. After she had died in 1856, Meijer married Serliena van Zuiden from Hoogeveen that same year. They had four daughters, all born in Dwingeloo: Klaartje, Judik, Sariena and Aaltje. Aaltje was born in 1865 and died at the young age of 19. The other three would be murdered during the Second World War. Klaartje was born in 1857 and married Levie van Esso in 1880. They had three children, all born in Meppel. Eliazer, Serliena and Alida. Levie died in 1901 and after his death Klaartje left Meppel, probably to her daughter Serliena who was married with Michiel Salomon van der Heijden (Oisterwijk 07-08-1875 - Leeuwarden 14-09-1940) in Leeuwarden. 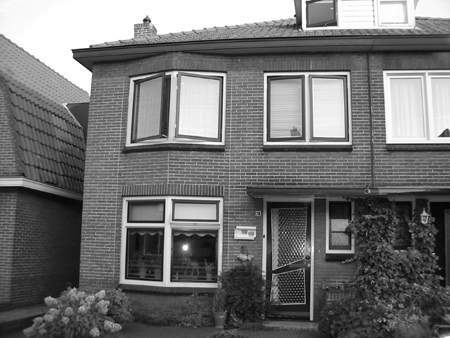 Klaartje's adress was Emmakade 39, her daughter lived on 44. Klaartje died at Sobibor in 1943. 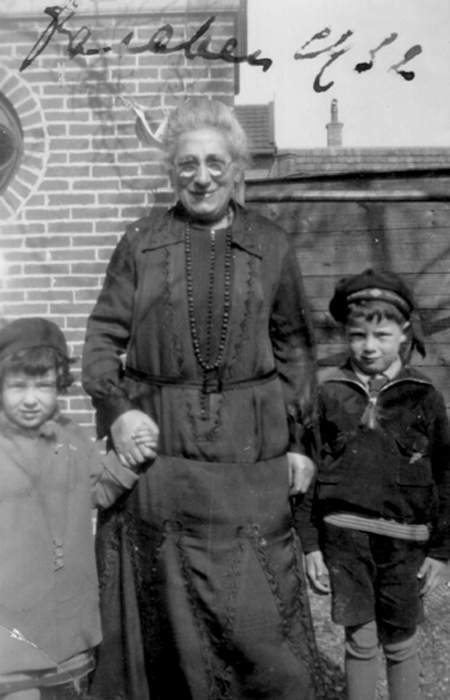 Saartje Van Esso with two of her grand children. Sariena was born in 1862 and married Levie Meijer van Esso in Meppel in 1892. They had two children: Meijer and Mauritz. Levie Meijer van Esso (nicknamed ‘Dikke Levie’) had a gold and silver shop on the 1st Hoofdstraat. When he died in 1931 one of the sons succeeded him in the business. 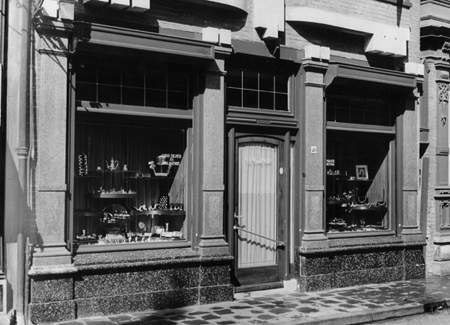 The jewellery shop on the 1st Hoofdstraat, where Saartje was an assistant for many years. The gold- and silver shop of L. M. van Esso, in the 1st Hoofdstraat , was started by Levie Meijer van Esso nicknamed ‘Witte’ (white) Levie or ‘Dikke’ (fat) Levie. He did not only sell gold and silver in his shop, but also went out with his merchandise to clients around Meppel. His wife, Sariena van Esso  Kan, assisted her husband in the shop and the clients knew her very well. Levie had two sons, Meijer and Mauritz who both came to work in the business. In 1920 Meijer took over the business, and rebuilt the front of the shop, giving it more character, which can still be seen today. His younger son Mauritz married Elisabeth Cohen and went to live above the shop. Mauritz died in 1928 at the young age of 33. When father Levie died in 1931, Meijer had to run the business alone. Meijer married Marie van Zuiden, daughter of Abraham van Zuiden owner of a well-known textile shop in the Hoofdstraat, and went to live in Wilhelminapark (15 Marten Ottenlaan). The couple had three children: Ada, Leo and Maurits. In 1938 the family moved to Amsterdam. The reason? Maybe Mr. and Mrs van Esso thought that behind the ‘waterlinie’, a strip of land ,flooded as a defence line it would be safer, or purely as a business move, as he had started a wholesale business in gold and silver there. At home Mrs van Esso started an infant class. In the picture below you see the infant class in the garden of the house; on the far right Leo van Esso. 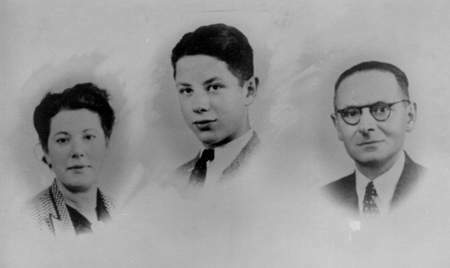 Meijer, his wife Marie and son Leo were murdered on 15 September 1943 in Auschwitz. Their children Ada and Maurits would survive the War. 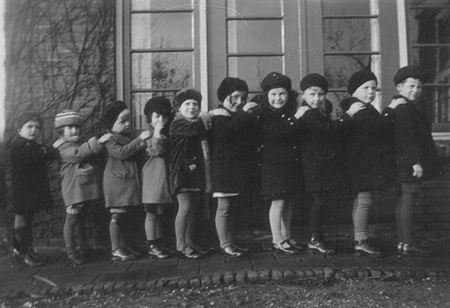 Infant class at the Van Esso family; far right is Leo. The shop in Meppel was kept on because Meijer’s mother was so attached to it. The daily management of the shop was in the hands of Mrs. Visscher-Weber who had worked for many years as a shop assistant for the Van Esso family. Mrs. Visscher-Weber was the daughter of Mr. and Mrs. Weber who lived at ‘Putstoel’. A short time later, on 13 February 1942, Omnia Treuhand Gmbh made A. M. Sustring director, most likely to liquidate the business, because on 19 September 1943 the business was closed. son Leo. The photograph was taken in 1941. Mr. and Mrs. Van Esso had a house on Zuideinde (number 67) where Mrs. van Esso lived after the death of her husband. When in 1942 the Germans came to collect the Meppel Jews, 80-year-old Sariena did not have the strength to go and hide. First she had to move out of her house, because the Germans confiscated it and she went to live for a few days with the Goldsteen family on the 2e Hooftstraat number 32a. She was not collected together with the other Meppel Jews on 3 October. 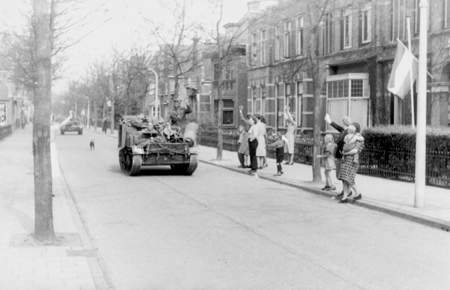 On 10 November 1942 the council of Meppel removed her name from the municipal register. Her new address was Amsterdam: Brouwersstraat 9hs. From there she was supposedly transported to Westerbork. 0n 18 Mei 1943, she was transported together with 2510 other Jews in cattle trucks to Sobibor and exactly three days later (on 21 May) they were put to death. Judik Kan  born 1859  married Benjamin Cutzien in Dwingeloo in 1886. He was from Dwingeloo. When they came to live in Meppel is not clear. During the first years of the war the old lady Judik Kan lived with the Zaligman family on Soembastraat (number 28). Just like Judik, the Zaligman family came from Dwingeloo. Judik Kan at 84 and her house mates were taken without mercy out of their house on 3 October 1942. After that things went fast: on the 9th of October they were loaded into cattle trucks to be transported to Auschwitz, where she died on 12 October.